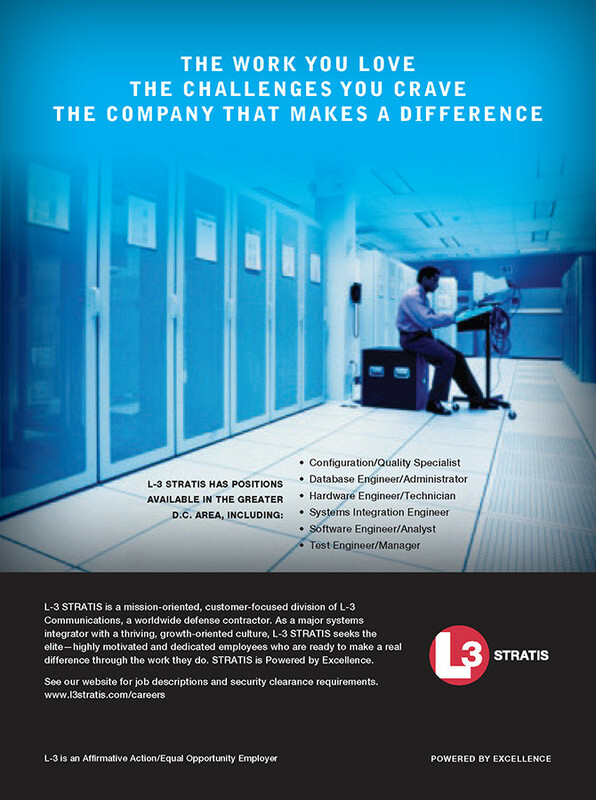 L-3 STRATIS was a rapidly expanding division that needed to quickly fill hundreds of positions for a variety of highly specialized work in the D.C. area. 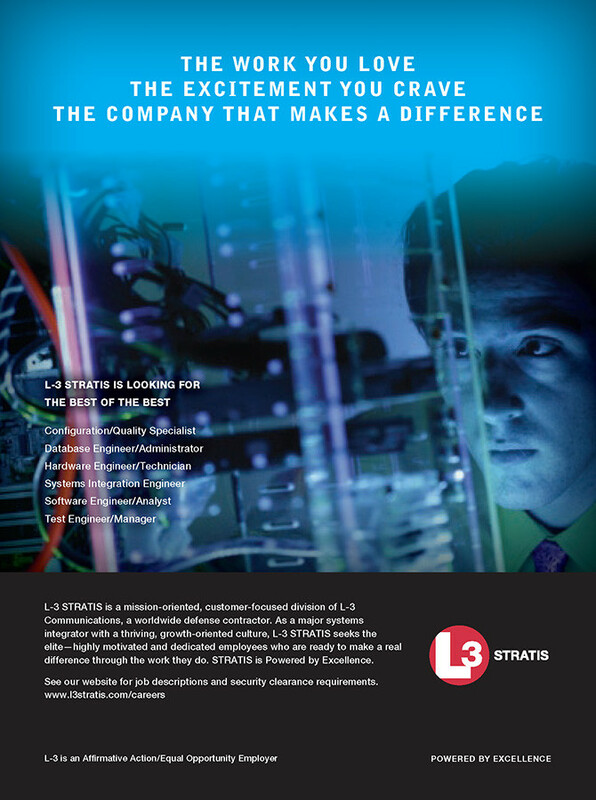 Due to the extremely competitive nature of the federal market, L-3 STRATIS was competing with other top government contractors for the same highly qualified employees—those with security clearances and expertise in cyber and intelligence. To reach these prospects, L-3 STRATIS selected Boscobel to develop a targeted federal recruitment advertising campaign and a series of employee appreciation events. Once the overall strategies and tactics were approved, Boscobel set out to negotiate and secure media; develop materials; and support L-3 STRATIS’ internal referral program with a series of employee engagement events. The biggest challenge: get the program up and running in a matter of days. Developing a recruitment advertising campaign with immediate impact and high visibility. 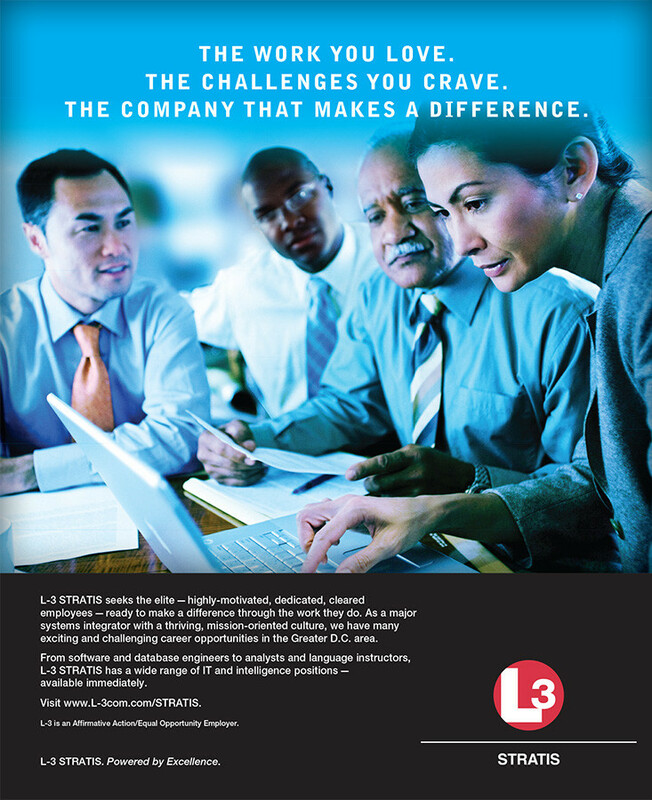 Distinguishing L-3 STRATIS from competitors and position the company as the employer of choice. Reaching passive and active job seekers in the D.C., Maryland and Virginia area. Showing a tangible increase in traffic to the L-3 STRATIS careers webpage. The campaign began with a three-month pilot in print and online media. Boscobel leveraged a premium sponsorship position in Washington Technology’s highly visible Top 100 Government Contractors issue to launch the new campaign. Boscobel then developed a plan that reached out to L-3 STRATIS’ highly specialized audience. The team put together an integrated strategy including online, social media and radio ads, as well as direct mailings to L-3 STRATIS employees. As a result of the successful pilot, Boscobel was asked to expand the employee recruitment campaign significantly – this time with an even more ambitious recruitment goal and an even shorter timeframe. The team jumped into planning and executing a media blitz that added new online, social media, radio, television and outdoor media, as well as a series of employee appreciation events to encourage referrals. Starting with a 12-month radio buy on WTOP, Boscobel added flights on other popular sports and music radio stations to the mix, as well as flights on local television stations during news and high-profile sporting events. The TV spots used the messaging from the radio ads and carefully curated images to emphasize the unique and challenging aspects of working at L-3 STRATIS. The advertising media buy also targeted other media with high impression rates in D.C., Maryland and Virginia, including Metro buses and rail cars, and online ads on WashingtonPost.com. Ads in national media like Facebook, LinkedIn, and popular sports, news and entertainment websites were geo- and behaviorally targeted as well, to connect with passive job seekers. In addition to the external recruitment efforts, Boscobel organized a series of employee appreciation events to encourage the company’s employees to utilize its referral program. The events, held at L-3 STRATIS office locations, fostered goodwill and gave on-site recruiters a chance to connect face-to-face with employees. Boscobel hired vendors, produced specialties, arranged menus, and worked onsite to ensure the ongoing success of the events. 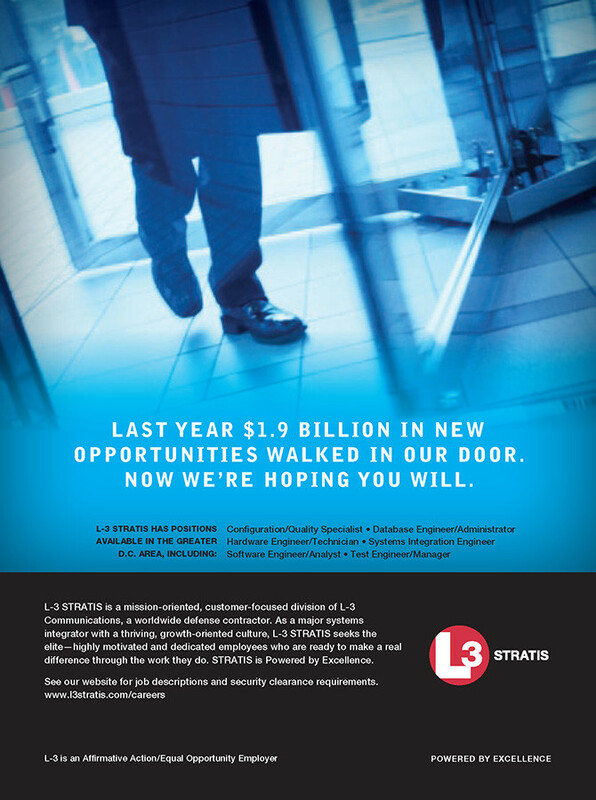 The campaign blanketed the D.C. area with L-3 STRATIS’ recruitment message, making a huge impact in an extremely short time period. The campaign generated approximately 500 million impressions, and Boscobel supplemented the paid impressions with nearly $200,000 in free advertising. 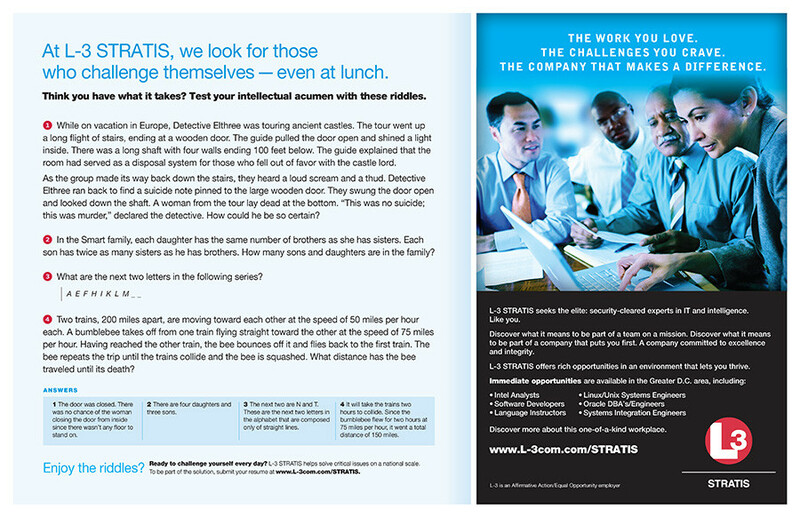 The ads and messaging were overwhelmingly well received, and L-3 STRATIS executives as far as New York shared positive feedback from numerous employees, customers and colleagues. Over the course of the campaign, the L-3 STRATIS careers webpage received significantly increased traffic, and, most importantly, L-3 STRATIS saw a 50 percent increase in applicants. In addition, Boscobel’s client, the vice president of employee communication, won the L-3 STRATIS Award for Excellence for her role in overseeing and executing the campaign. Your team made this campaign a true success. You did a phenomenal amount of work; you did it amazingly fast; and you did it extremely well. I know I asked for a lot from you—to turn things around on a dime every day—but you made it all happen. Thanks for the great work you do, and thanks for making the campaign so successful.